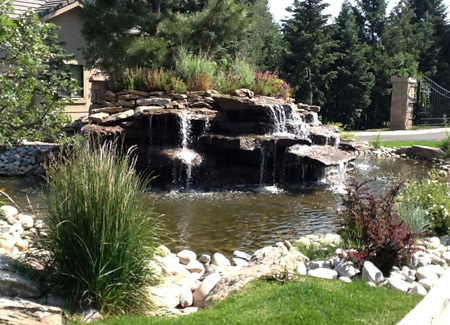 Paradise Outdoor Design and Landscaping specializes in custom waterfall design and pond construction creating natural looking waterfalls, waterfall landscaping and water features. We serve the front range of Colorado including: Monument, Castle Rock and Colorado Springs, Colorado. In addition to being an unforgettable visual centerpiece for your landscaping a waterfall will be something you and the local wildlife always enjoy and appreciate. Give us a call and we can help you design a stunning waterfall that fits your budget and that will increase the value of your home. Waterfalls have always been popular. 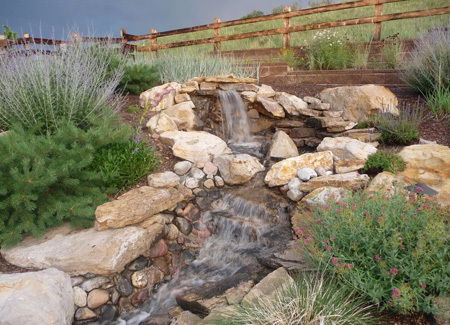 In fact, one of today’s hottest Colorado Springs landscape trends is the pondless waterfall. The relaxing sound of a slow moving stream gently cascading over a waterfall is a very soothing and enjoyable addition to any landscape. At Paradise Outdoor Design and Landscaping, beautiful, low-maintenance waterfalls and water features are our specialty. Call Us Today about Installing a Waterfall!